Inspiration for painting often comes in different forms. One such inspiration is a science fiction novel by British author John Christopher titled "The White Mountains", part one of a trilogy of books published in the late 1960s. This children's adventure paints a vision of a future post-apocalyptic feudal earth taken over by alien metal tripods, subjugating the human race through a mind-controlling cap and destroying all modern technology. The ruined earth vision it depicts is compelling and often informs my choice of painting subjects such as abandoned railways and other derelict places. We had no idea what Volts had been, but the notion of danger, however far away and long ago, was exciting. There was more lettering, but for the most part the rust had destroyed it. LECT CITY: we wondered if that were the city it had come from." This tenuous link to the past - of previous generations leaving their mark in an untimely and anachronistic and candid fashion - is what that I find intriguing and mysterious. Unlike the ruins of ancient times, where ornate columns and gothic arches bring a sense of fairytale romance, the structures described in John Christopher’s story are functional everyday modern buildings. This scene depicts the empty and trackless tunnels at Highgate station on the North London Heights, painted as the evening light faded. Coincidentally this location was used for the filming of a BBC television adaptation of John Christopher's trilogy in the 1980s. I enjoy seeking places to paint which capture this aesthetic. 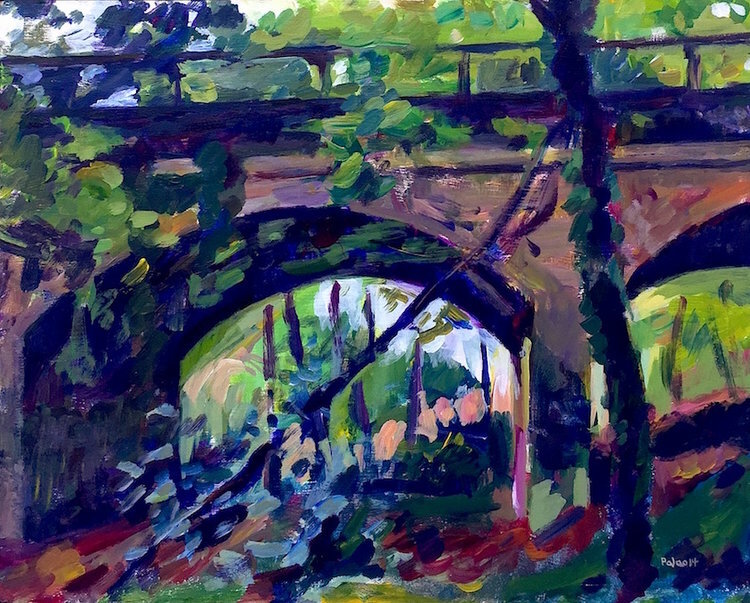 A crumbling section of an abandoned road (A625) in Derbyshire painted on holiday in 2011, for example, seemed to fit perfectly into the description of the landscapes that Will Parker encountered on his hazardous journey to the White Mountains. 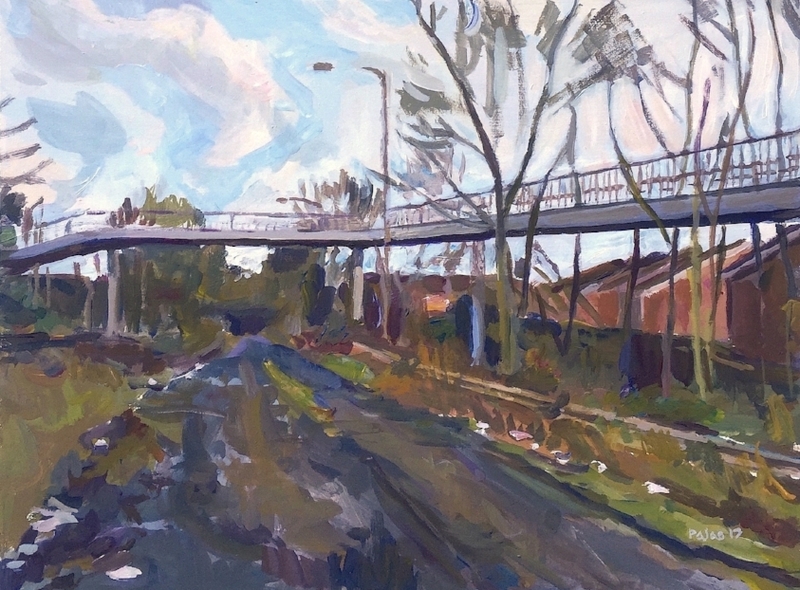 The painting "Abandoned Slip Road near Mill Hill II" (pictured top of the page) shows lamp posts, once gleaming and emitting bright light, now standing rusted and broken against a bleak sky. Vehicle barriers, made of corrugated metal are covered in moss and obscured in undergrowth. Painting plein-air in secluded and abandoned locations is unsettling to say the least, especially with the gloomy isolation that is usually found in places off-limits... not to mention the possibility of unsociable elements and danger. I usually paint with a limited colour palette to help capture the forlorn atmosphere and quality of man-made materials fused with nature. These are places which, by design or by accident, rub against the fabric of time. John Christopher's story of an abandoned modernity provokes an unusual thought process when painting such places.